The city’s premium shopping retreat, Address Dubai Mall is gearing up to join the nation in celebrating the 47th UAE National Day. Commemorating the occasion, the exceptional talent of Address Dubai Mall will be parading the premises of the hotel with an outstanding, 20-meter long UAE national flag, as a befitting tribute to the UAE National Day. The sheer size of the flag will be a stand-out attraction for the spectators and encourage the guests to join the electric atmosphere of celebrations. Guests are encouraged to join in the spirit with UAE Flags, available at the hotel’s reception. Furthermore, the hotel’s boulevard wall emblazoned with the colours of the UAE flag, as part of the flag raising ceremony, to highlight the spirit of the occasion. The celebrations will conclude with the releasing of balloons in the UAE flag’s signature colours; red, green, black and white. Alongside incredible displays throughout the hotel, UAE residents staying at Address Dubai Mall will enjoy benefits such as complimentary breakfast and tickets to Dubai Aquarium and Underwater Zoo per person per stay. As a U By Emaar member, residents are eligible to an additional 10% off the Best Available Rate. UAE nationals and residents looking to indulge and pamper themselves can enjoy 47% off select spa treatments at The Spa at Address Dubai Mall for one-day only on 2 December 2018 from 11am until 8pm. 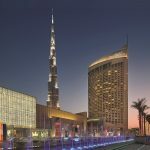 The distinguished location of hotel in the heart of Downtown Dubai, offers guests an unparalleled destination to view the spectacular LED show featuring UAE’s flag colours on the iconic Burj Khalifa. Join us as we celebrate with the nation and create remarkable memories with those closest to you!